If you've ever created a social media post and needed to neaten it up or hide that ghastly utm tracking links you would be well aware of link shorteners like goo.gl, Bit.ly and owl.ly and has helpful as they can be they can be a bit boring or look unwelcoming with the random ASCII values they produce. But this may now be a thing of the past. You can now turn your links into emoji with this crazy emoji link shortener. Emoji link shorteners are URL shortener with a twist: instead of making your links shorter using characters, it uses emoji. You’ll surely get an increase in click-throughs to your links on social media while this is still novel. Emoji are simply characters that are a part of the Unicode, the popular standard for indexing characters. t makes sense that you can use emoji characters. Emoji URLs don’t seem to work with the .com TLD, and perhaps only works with the .ws TLD. This is one of the first emoji URL shorteners in the world. Emoji link shorteners have been used already by popular brands including 7-Eleven, Wired and Huffington Post. Even if you have never created a shortened link, you most definitely have used one at one time or another. Link shortening is the simple procedure of taking a full URL and appointing it to a much shorter URL, that could be easier to remember, to type, and would be fully visible on a small chat screen. If you ever clicked on a goo.gl or bit.ly link somebody sends you, those are the two most popular URL shortening services. But they are far from the only ones. The emojis are selected in random. If we enter a URL twice times, you will get a different result for each attempt. A list of emoji link shorteners? Now that you can stand out from the crowd with your cool new emoji URLs, use them wisely. The internet never takes itself too seriously and a little lightheartedness goes a long way. 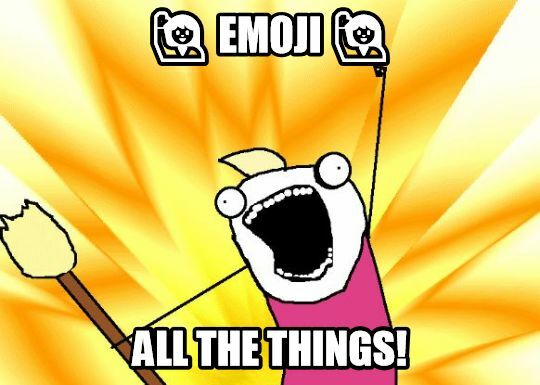 So feel free to share the emoj-oy with others and add a little fun to your tracking.